Options are instruments that belong to the derivatives family, which means its price is derived from something else (the underlying asset, items like listed shares, oil price futures, and many more). The price of an option is intrinsically linked to the price of the underlying asset. A call option is an option to buy underlying shares on or before its expiration date. At the time of buying a call option you pay a certain amount of premium to the seller which grants you the right to buy the underlying shares at a specified price (strike price). A put option is an option to sell an underlying shares on or before its expiration date. Purchasing a put option means that you are bearish about the market and hoping that the price of the underlying shares may go down. In order for you to make profit the price of the shares should go down from the strike price of the put option that you have purchased before or at the time of its expiration. When is an Option out-of-the-money? If the price of YHOO shares is at $37.50, then all of the call options with strike prices at $38 and above are out of the money. Why are they out of the money? They are out of the money because those options don’t have any intrinsic value. If you have the right to buy YHOO at $40 and the current market price is $37.50, then that call option is out of the money by $2.50. If you had that call and you had to exercise it, you could buy shares of YHOO at $40 and sell them immediately in the open market for $37.50 for a loss of $2.50. Would you do that? Absolutely not! So they are out of the money. Likewise the YHOO $45 and $50 calls are also way out of the money. 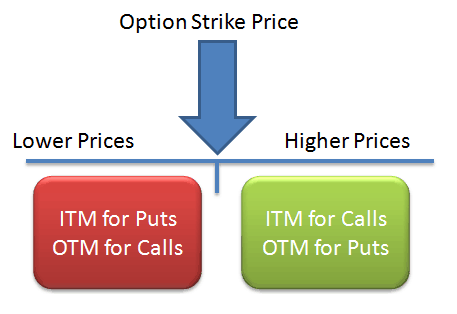 If YHOO is at $37.50, then all of the call options with a strike price of $37 and below are in the money.